In the world of mining and exploration, it's been said time and time again that the best place to find a mine is close beside another mine. And if the saying, "location, location, location" means anything, then both these sayings ring ever so true for our featured mining company. Just a quick two-hour drive west from Vancouver British Columbia, you arrive at the small town of Hope, BC. 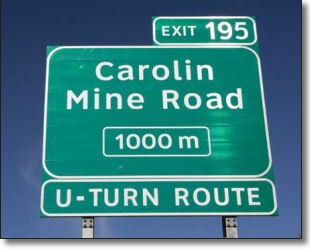 Then a short 16km up the Coquihalla Highway and you will see a big sign that says, Carolin Gold Mine road. It's up this road that you will find the old Carolin Gold Mine, right in the heart of the Coquihalla Gold Belt and there is one junior miner that's at the center of it all. That company is New Carolin Gold Corp.
New Carolin Gold Corp. is the junior miner that owns this large group of mining claims known as the Ladner Gold project. The company's land package now exceeds 144 square kilometers and covers substantially all of the accessible Coquihalla Gold Belt and within this area is a grouping of old mines. There's the Carolin Mine, which is a former underground small gold producer that worked from 1982 - 1984, the Emancipation Mine, another small gold producer from 1916 - 1941, the Pipestem Mine, which was also a small gold producer from 1935 - 1937, along with numerous other gold prospects . New Carolin has big plans for this group of claims and old mines. First off, a lot of the infrastructure from when the original Carolin Mine was in operation is still there. There is a ball mill, rod mill, regrind mill, coarse ore bin, and an underground crusher. With the mill location only 6 km from the highway up a gravel road, there is ready access to hydro power. Being as the Carolin Mine was being worked in the early 1980's, the underground infastructure is still in good working condition. Two ramps, at the 1015 and 900 levels are both accessible, as well as the 800 level, which is track accessible. The Carolin Mine also has a tailings storage facility in excellent condition that is inspected on yearly basis by an engineering firm. One of the issues that comes up with older underground mines is flooding. That's the added bonus here with the Carolin Mine, as there is no flooding on any of the levels. The mine itself produced 47,000 oz gold during a short two year span in the early 1980's. The other two mines; the Emancipation has four portals and 2,000 meters of underground and surface diamond drilling in 33 holes. Historic intersection of 20.5 g/t gold over 1.5 metres. Historic surface intersections includes 12.7 g/t over 1.4 metres. The Pipestem mine has two portals and 650 meters of underground diamond drilling in 10 holes. Historic intersections on the Pipestem from underground drilling of 0.90 g/t gold over 41 metres and 3.00 g/t gold over 5 metres. Historic surface intersections include 4.45 g/t over 5 metres. 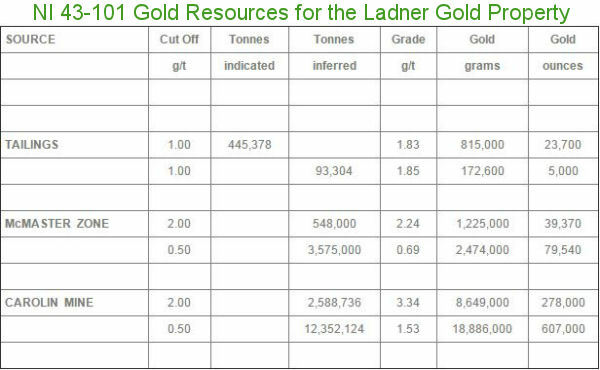 The Ladner Gold project already has an active mine permit for both underground and surface. A current water license is also in place. All of the old mines follow a fault line called the Hozameen fault. Along this fault line is a zone of real interest and that zone is the McMaster zone. After two completed NI 43-101 gold resource estimate studies on the Carolin and McMaster they discover an Inferred Mineral Resource estimate is 607,000 oz gold at the Carolin and an Inferred Mineral Resource estimate of 79,540 oz gold at the McMaster zone. After going over all the data that the company has on hand, management is looking at an open pit model design for future mining operations that would entail mining both the Carolin Mine and the McMaster zone. This of course would include an underground component to the mining operaton as well. A mine development map dated May 1981 shows the 800 level being extended north for 1.2 km to the McMaster zone with proposed cross cuts for drilling. With all this information at hand the company has decided to move ahead with mine development plans. This would include an exploration strategy on the Coquihalla Gold Belt. This strategy would include exploring underground showings more indepth and going over areas that have mineral potential, but have had minimal exploration. The second strategy would be increase market visibility, continue with creative financing, continue with government and community, as well as First Nations dialogue. At present the company's stock trades on the TSX Venture under the ticker LAD and has 75 million shares. This translates to a market cap of 3.7 million. The 52 week trading range for the stock has been a low of 2 cents and a high of 8 cents. Today there are thousands of junior mining companies to invest in. With the down turn in metals and commodities in general, investor taste for these kinds of investments have turned sour. However, prudent and contrairian investors know all to well that these kind of investments run in cycles. Knowing these cycles there is no doubt that the world is at the bottom of the cycle and the time to look at investing in these types of investments is now. Investors who understand this will be active in evaluating companies and projects that have a lot of positives and this is a catagory that New Carolin Gold Corp. falls into. Here's a quick list of positives for New Carolin Gold Corp. Location! Mining friendly BC Canada. Location! Located just out side the lower mainland. 6 KM distance to major highway. 150 KM from Vancouver. Permits in place. Permits for both underground and surface. Current water license is also in place. Existing older mines with proven mineral resource. Lots of potential for expansion and additional drilling. 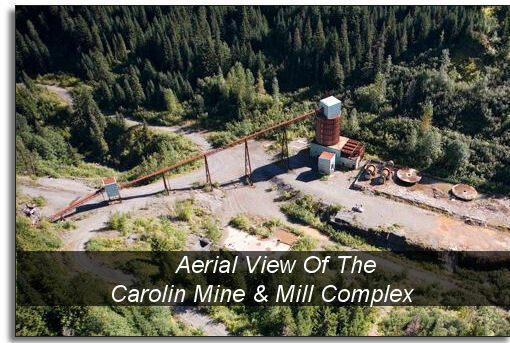 To find out more about New Carolin Gold Corp. and this project, Click Here to visit their website. There you will find all an exstensive amount of information along with contact information.